A medieval quatrefoil cast copper alloy book mount . The book fitting has a central circular conical boss with a flattened top and stepped lower part of two steps which sits on a square base. The back of the base is hollow in the centre under the boss. From the base projects four arms, one from the centre of each side. The short arms have a fleur-de-lis terminals each with a circular rivet hole in the centre. The entire piece is 44.2mm by 44.7mm and 7.7mm thick; it weighs 19.76g. The book fitting is of Howsam's (2016, pg. 92) type B.1.2. and is similar to her example shown in figure 2-39 no.189. She gives a date circa to late-fourteenth to mid sixteenth century. A mount similar in form can also be found illustrated in Read (2001, 16; ref. 115) dating to the 14th century. Many similar mounts can also be seen on this database at WAW-3649D6, SF-B41B47, DENO-42532D, SOM-B81C47 and SUSS-765001. 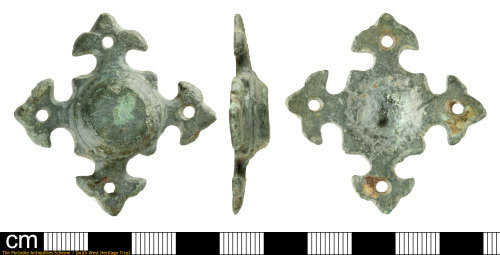 It is possible this mount was associated with Sherborne Abbey.